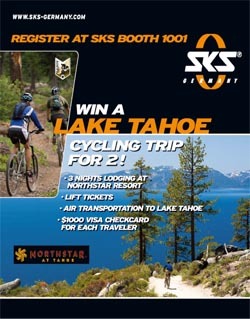 SKS USA is holding a giveaway for a Lake Tahoe cycling trip at the upcoming Interbike Show in Las Vegas. U.S. bicycle retail owners and employees are invited to SKS Booth 1001 to register for a Cycling Trip for (2) to Lake Tahoe. The drawing will be held on Friday at the show, and registrants need not be present to win. Retailers are encouraged to stop by booth 1001 to see the NEW 2009 SKS products and revisit SKS's line of "Commuting Essentials". Travel dates subject to availability at Northstar Resort in Lake Tahoe.